Contact Bridges to place your order. 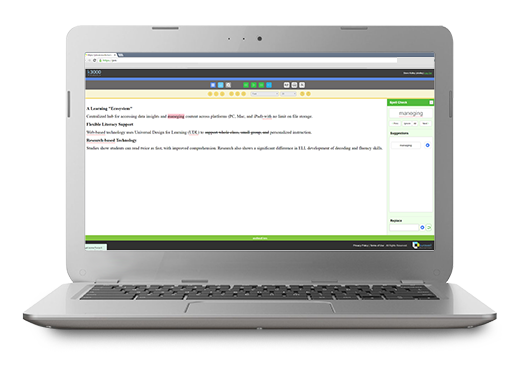 K3000 is literacy support software with powerful reading, writing, test-taking, and study skills tools that makes curriculum accessible to all students. And with the Web License you get access to firefly for full literacy supports on Chromebooks, Android, tablets and plus reading on iPads too. New Chrome extensions and apps means its never been easier to read, research and write on the web. Ideal for Google Apps for Education (GAFE) environments. And with Kurzweil web license you can now have offline access too for exams, bad internet connections, deadzones et cetera. It is particularly appropriate for students with learning disabilities such as Dyslexia, those who require reading intervention, students struggling with reading comprehension and English Language Learners(ELL). It is an ideal literacy instructional tool for any size education community that is putting UDL (Universal Design for Learning) or an RTI (Response to Intervention) in action. Kurzweil 3000 literacy software is a cost-effective solution for providing support in the classroom, at home and with the web license and firefly-- anywhere, on virtually any platform. Special pricing available for unlimited school or district wide web licensing. For free K3000 Webinars, click here. With a K3000 Unlimited Web License for your school district everyone - staff, students -- get access to K3000 files through the tool of their choice: Windows or Mac, school or home computer, firefly through any web browser and the firefly iPad app. Web app means K3000 reading and writing supports on any PC: get docs directly from Google Drive, Upload pdf from the desktop or thumb drives or use Universal library. From school, home, public library, friend or family PC etc. The firefly iPad app is exclusive and free to all Kurzweil 3000 Web License customers. Easy, effective mobile access with the popular, portable device. With a web license, FIREFLY gives you access to Kurzweil books and pdf’s through the web browser on any computer: Windows, Mac and Chromebook. There’s even a direct shortcut to your Google Drive if you've gone GAFE (Google Apps for Education). All these features work on Chromebook and through the new Chrombook App. Kurzweil's new offline mode offers users with a Web Access subscription the opportunity to access k3000 when internet connections are spotty or simply not available. Students who are traveling, or on break for the holidays, can get the supports they need while they’re away. Offline mode also has great applications for providing test-taking accommodations on disconnected computers. Log in to k3000 when the computer is connected to the internet. The k3000 credentials are saved in a secure location on the computer. When internet connectivity is either low or gone, users will be prompted to work in Offline Mode. Any work saved to the computer can then be uploaded to the k3000 online library when the internet connection is restored. Note that web-based features, such as online reference and translation will be grayed out until the computer is re-connected to the internet. Now Available for free to all Web License Users! The new user interface for the Windows/Mac desktop, is simpler and more intuitive to use for new users, but keeps all the rich functionality that experienced Kurzweil users have grown to expect. The update includes a new start screen, but the navigation at the top still acts the same. Web license customers receive this upgrade and all upgrades to their k3000 at no cost. Just run the update on your k3000 and you’ll get the new version. Encouraging active reading -- an educator can embed bubble note questions right in the text! Use for comprehension, making connections, vocabulary development... the teaching possibilities are endless. And this is just one kind of note. K3000 has footnotes, text notes, stickies and even voice notes, too. NEW! Image Reader reads locked text, such as images, PDFs and even text in a Flash player! Open multiple formats ideal for high speed scanners: pdf, tiff, jpg, docx, etc. Highlight key text and extract for note-taking, learning key vocabulary etc. Use sticky notes for instructions, call outs or pre-reading questions. Dictionary and thesaurus support is always just a click away. Word prediction is better than ever and word lists are an effective way to incorporate new vocabulary into writing. ...or use "Extract to Graphic Organizer" too! Test-taking and test making feature including auto fill-in-the blank, circling answers and locking-out features for high-stakes testing. Now K3000 standalone is dual platform, Mac and Windows on the same media -- you no longer have to specify the operating system when you order. For academic success students have to constantly add to their vocabulary. Whether just beginning long answer writing in the primary grades, English Language Learners at Levels 1 or 2 or curricular specific terminology at all stages, Kurzweil has the tools you need. Widgit's 40,000 word symbol vocabulary is used for curricular vocabulary support and differentiating confusables. Catch the Buzz-firefly an Universally accessible web-based literacy solution! Anytime, anywhere access to digital, text-based content, supplemented by powerful literacy tools that enable individuals with the cognitive ability, but not the literacy skills, to achieve their academic or personal goals. firefly is the newest member of the Kurzweil Educational Systems product line and was developed based on years of experience producing the award-winning Kurzweil 3000 software. firefly gives you the ability to use many of the great features of Kurzweil 3000 from anywhere you have an internet connection. firefly is free with a Kurzweil 3000 web subscription! Fully designed and built to work on the iPad, the firefly App makes accessing and reading digital files from your Kurzweil 3000 Universal Library simple and easy! Just download the firefly app from the App Store and use your existing firefly login credentials to access your private and public documents from your Universal Library. firefly for the iPad provides mobile anytime, anywhere access to your files — from the desk at school to your bedroom at home. The firefly iPad app can be obtained from the App Store by searching the education category using the keywords "firefly Kurzweil 3000." Why Choose Bridges for Kurzweil 3000? Bridges, the Canadian Kurzweil 3000 Experts. Bridges trains across Canada in English and French. We've presented at home and abroad on K3000 at international conferences. Bridges literally wrote the book on Kurzweil training! It was Bridges that Kurzweil contracted to create the training manual they use around the world, Kurzweil 3000 Foundations. Bridges can get the most out of your purchase. We've counselled dozens of school districts across the country on how to turn old licenses, single copies, Mac, and old versions into network licenses for a fraction of the cost of buying. 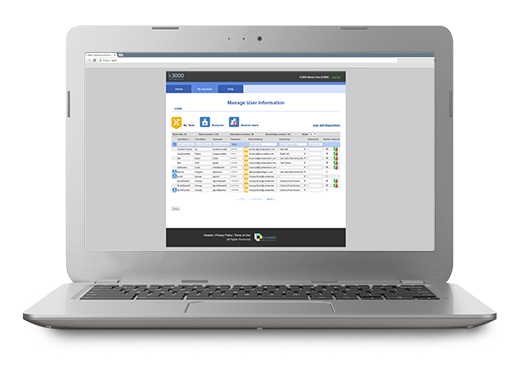 We were the first to implement web-based licensing for a school district, not just in Canada but anywhere. Bridges stocks a substantial warehouse with inventory to reduce shipping and turnaround time. Bridges tracks and records all serial numbers easing future upgrading, maximizing licensing discounts or replacing lost software. We can issue reports on volumes, serial numbers/customer shipping locations, etc. at your request. Bridges has expert technical support In-house in English or French. PLEASE NOTE: Customers cannot return software for a refund. However, we do offer a store credit for the full amount if returned within 21 days. After 21 days a restocking fee may apply. Access content and common literacy supports any device or computer with internet access and dive deeper with the most comprehensive suite of literacy tools installed directly to Mac and Windows computers.